Another Beautiful Day in Paradise. It was a little cool but warmed up nicely. We still had that East wind but didn't head into it for long. We did our normal Ft. Desoto route but went a little further North to check out the parking lot by the ball field. 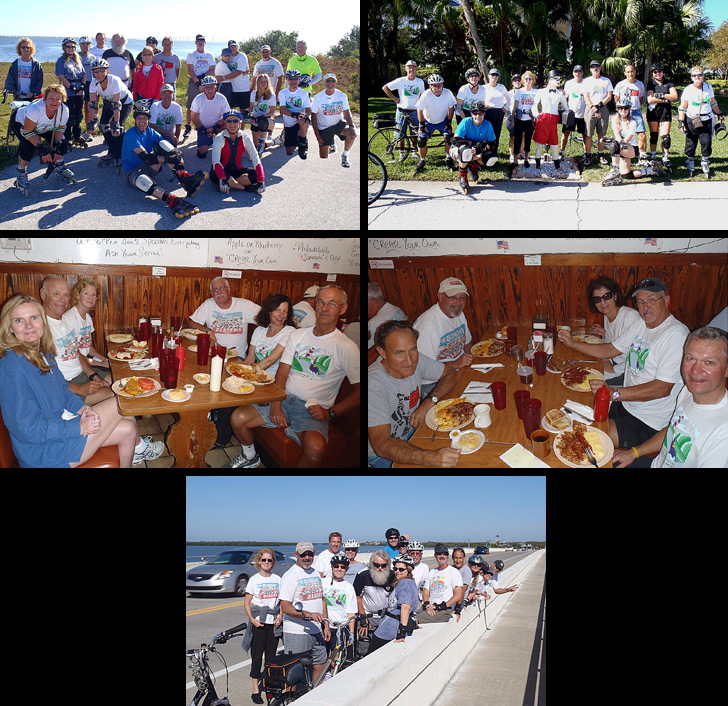 Pinellas Trail Skaters John C, Patti Y, Nick G, Lorranine L, Connie G and Tim R. joined us. Absentees Ken L, Cindy B, Vivian A, Kim F, C Rob and Ellen H joined us. Welcome all. Dee indicated we did 12 miles with the little extra to the ball field parking lot. We investigated the parking lot with thoughts on where to park when they started the $5 parking fee inside Ft. Desoto. We had 9 bicyclists. We Brunched at Skyway Jacks. They were pretty crowded but Rick and Ginnie had gotten there early and put in a reservation for us and we got right in. We squeezed into two booths. Service was good considering how busy they were. Rob H snuck away before giving us a Brunch rating so Kim F did it and gave her Brunch a 9.5.